The latest art installation from Shia LaBeouf and his regular collaborators — Finnish artist Nastja Säde Rönkkö and British artist Luke Turner — launched this morning in New York City at 9 a.m. EST. 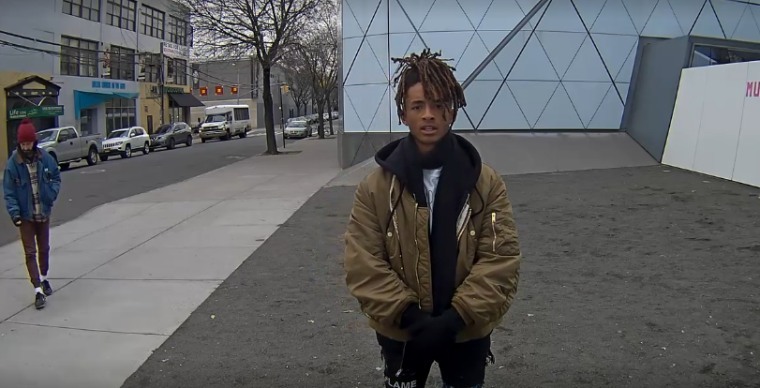 Marking the inauguration of Donald Trump, the piece is titled "He Will Not Divide Us," and features Jaden Smith. Right now, you can watch Jaden repeating the phrase "He will not divide us" into a camera mounted on a wall outside the Museum of the Moving Image in Queens. After Jaden, others will be invited to say the same phrase into the camera for as long as they wish. According to a press release, the performance will continue live-streaming for four years, "or for the duration of the presidency." To take part in this act of resistance, head to the Museum of the Moving Image; or simply click here to watch.